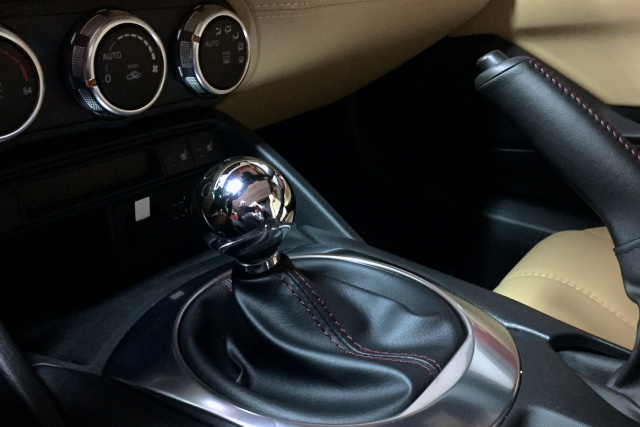 A Voodoo shift knob is the fastest and easiest mod you'll ever make to your car. Improved short-shifting capability is immediate! 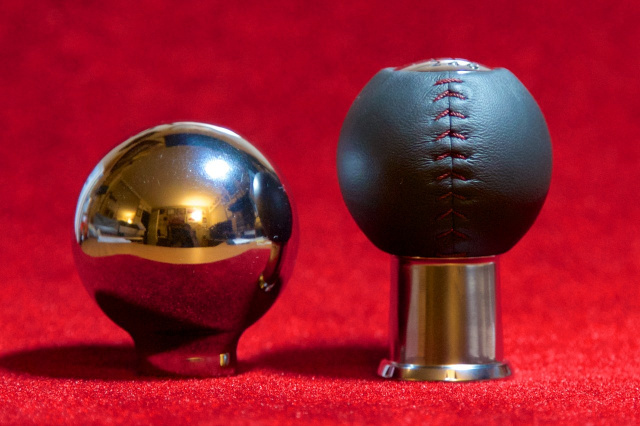 Voodoo shift knobs have been the enthusiast's first choice for driving enhancement since 1992. Breaking news: Team Voodoo shift knobs confirmed to fit the 2016+ MX-5 Miata (aka: ND). Manual transmission ONLY. NOTE: Listed below are the different finishes of Voodoo knobs that we currently have in stock. These Voodoo knobs fit Mazda Miata, Mazda RX-8, Nissan 350Z and Infiniti G35. We also have Voodoo knobs for Subaru & Toyota vehicles (including the BRZ & FR-S twins). Other makes and models as well as other finishes will be added soon. Please check back often for updates. Please note: Voodoo knobs do not fit 2014+ Mazda3 (sorry). The "Pistol Grip" Voodoo knob is a classic Voodoo shape revived for a limited time. It is 1 3/8" diameter at it's widest (near the top), tapering to about 7/8" diameter at it's base. The knob measures 3" tall, but the thread is recessed 1" so it meets perfectly with the top of the boot, and still reduces the throw between gears. NOTE: this Voodoo knob also fits Toyota Tundra trucks (click on item for details, then click on photos).& it also fits Audi R8 with manual transmissions. Thank you to customer Chris Strickland for Tundra photo. Thank you to customer Richard Kessler of Tallahassee for the MX-5 photo. NOTE: This Voodoo knob also fits Lexus IS 300's &Toyota Tundra trucks (click on detail for more info, then click on photos). This Voodoo knob also fits Audi R8's with manual transmission. Now, short throw Voodoo shifting for all Automatic transmissioned NC (2006-2015) MX-5's! Easy installation, good looks, and improved short-throw shifting (when using tiptronic mode). Thread is 8 x 1.25 mm. Pearl finish. NOTE: this Voodoo knob also fits Toyota Tundra trucks. The Voodoo knob lowers the height of the shifter by about 7/8". This knob also fits Audi R8 with manual tranmissions. NOTE: This Voodoo knob also fits Lexus IS 300's &Toyota Tundra trucks. This Voodoo knob also fits Audi R8's with manual transmission. Want to own a truly unique Voodoo knob? Here it is: Solid TITANIUM in a Spun finish. Very popular with S-2000 owners, this Team Voodoo Magnum TITANIUM shift knob is almost twice the weight of our Aluminum version. Plus, you won't see these on every other Miata! The Magnum Voodoo knob is a 2 inch sphere of solid aluminum, with a "Spun" finish. It's specially drilled mounting hole provides a quick & easy short-shift conversion, and feels great in your hand. A must for every sportscar enthusiast. NEW! Available soon - currently in production. The "Black Pearl" magnum Voodoo knob is a 2 inch sphere of solid aluminum, with a transparent black powdercoat finish over a spun knob, similar to our VERY popular Pearl finish but in a darker shade. It's specially drilled mounting hole provides a quick & easy short-shift conversion, and feels great in your hand. A must for every sportscar enthusiast. Now available geniune Voodoo knobs to fit Subaru WRX and Toyota Supra. This is the same Magnum design so loved by Miata enthusiasts world-wide but now adapted to fit the WRX. Thread is 12 x 1.25 mm. All of our Team Voodoo competition shift knobs are machined from solid 6061-T6 Aluminum, EXCEPT this one. This Voodoo knob is VERY popular with the Honda S-2000 crowd; it is machined from solid Titanium! Almost twice the weight of the aluminum knob, and a noticably darker color, this Voodoo knob is designed for the individual who really wants to be different. Or who just enjoys the solid feel of a heavier shift knob. Fits Subaru WRX & Toyota (Lexus) with 12 x 1.25 mm threads. Now available geniune Voodoo knobs to fit Subaru WRX (without reverse lock-out) and Toyota Supra. This is the same Magnum design so loved by Miata enthusiasts world-wide but now adapted to fit the WRX. Thread is 12 x 1.25 mm. Now available geniune Voodoo knobs to fit Subaru WRX and Toyota Supra. This is the same Magnum design so loved by Miata and Honda S2000 enthusiasts world-wide but now adapted to fit the WRX. Thread is 12 x 1.25 mm. Finish is smooth black (aka Piano Black) powder coat. Now available geniune Voodoo knobs to fit Subaru WRX and Toyota Supra. This is the same Magnum design so loved by Miata and Honda S2000 enthusiasts world-wide but now adapted to fit the WRX. Thread is 12 x 1.25 mm. Finish is textured black (aka Wrinkle Finish) powder coat. ThreaThread is 12 x 1.25 mm Thread is 12 x 1. The magnum Voodoo knob is a 2 inch sphere of solid aluminum, polished to a high-brilliance. It's specially drilled mounting hole provides a quick & easy short-shift conversion, and feels great in your hand. A must for every sportscar enthusiast. This is the standard diameter (1-7/8") neckless design of our classic Voodoo knob for Ferrari. It includes the standard 5 speed shift pattern engraved on the top of the knob. Thread is 10 x 1.25 mm. Fits: all 246 Dinos, 308s, 328s, 348s and Testarossa models (GTB, GTS, etc. ), regardless of year. Our popular replacement brake grip for all 1st & 2nd generation (NA & NB) Miatas, but in a new finish; Black Pearl. Designed to match the Black Pearl Voodoo Competition shift knob. Team Voodoo racing decals - 2"
Team Voodoo racing decals - 4"
Team Voodoo racing decals - 6"
NOTE: there is a peel-off paper over the top of the large decal to proctect it from scratches when handling. This is removed upon application. Our popular prancing rooster makes his debut as a stand-alone emblem. Attached with a special automotive adhesive foam tape , your Voodoo emblem can be attached pretty much anywhere; hood, fenders, grill, bumper cover. Or on your laptop, breifcase, suitcase, etc. The emblem is 3 inches tall x 2 inches wide x 1/8 inch thick. It is chrome plated ABS with a red eye. Team Voodoo now has fully-embroidered patches available in the four-inch size. Have a jacket that needs a Pollo? Now you can sew on one of these patches and go stylin' with the best of them! Static-cling decals are available for those who want to apply the Pollo in a fully-removable form to the inside of their windshields or vent window glass. Static clings, like the medium decals, are four inches tall. Want to make your Voodoo shift knob truly your own? Get it custom engraved by none other than The Knobmeister himself. For contact info go to our Links page. Check this space often. We will soon have some very exciting news regarding the "Nearly Legendary" Team Voodoo shift knob line. You don't want to miss this. We've added the *new* Voodoo knob for automatics, but there is still more to come. Can you say Black Chrome? Stay tuned. Just added Subaru WRX Voodoo knobs in Magnum size and available in Polished finish. Note this Voodoo knob also fits Toyotas. Another WRX Voodoo knob has been added; this one fits the WRX STi with reverse lockout. And it's available in our two most popular finishes: Spun and Piano Black. Soon available in Pearl finish. Note: these Voodoo knobs will also fit the Scion FR-S & Subaru BRZ.